According to this web page, we are currently undergoing high radio meteor activity. Whether this translates to high visual meteor activity is another thing. I can't check the skies, too much cloud. Anyone else out there with clear skies. 31 May, Moonight, Mars and Meteors from 73P? 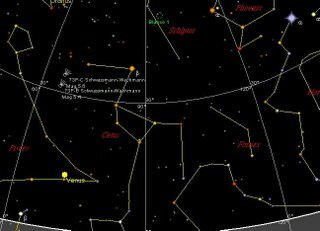 As noted by Tom, the night of Wednesday May 31 is the time of closest apporach of the largest fragment of 73P. 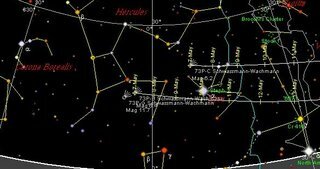 The t-Herculid meteor shower is associated with comet 73P, so will we get a decent meteor shower from it? Probably not. Because the comet is relatively so far away (around 0.4 au) it is very unlikely we will see much at all, perhaps 1-2 meteors per hour. 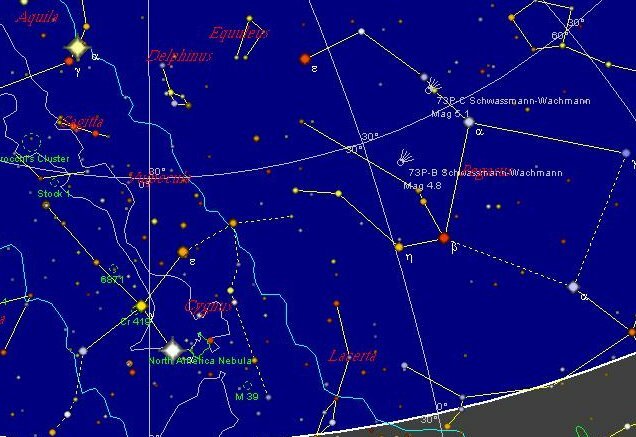 In the Southern hemisphere, the radiant (which is near the fouth magnitude star delta Bootis (cirlced in the image above)) never gets very far above the horizon (around 25 deg at Adelaides latitude), so we are likely to see even fewer meteors. Then again, we have been surprised before, so why not take a look. 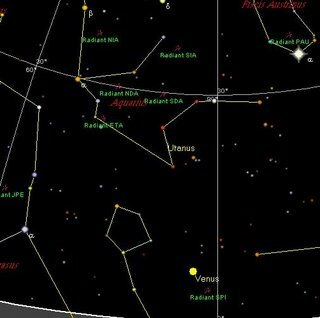 While the radiant isn't high in the Southen hemisphere, in Australia at around 11 pm AEST the comet will pass through earths orbital plane, so this should be the time of maximum meteors (the Americas and Europe miss out on the plane crossing to a large extent). See this interesting paper on the t-Herculids. The best times for meteor showers for 73P is 2022 and 2049. Here's a nice image of 73P from earlier in the month. (Click to enlarge: northwestern horizon at 6:00 pm ACST, similar views will be seen at similar local times elsewhere in the Southern Hemisphere) 73P meteors aren't the only reason to go out on Wednesday May 31. 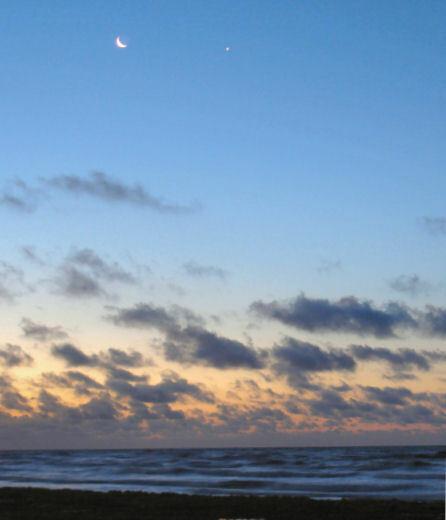 In the early evening, Mars is close to the crescent Moon. With Saturn nearby, and Castor and Pollux below, this will be an attractive (and photogenic) time to view the sky. 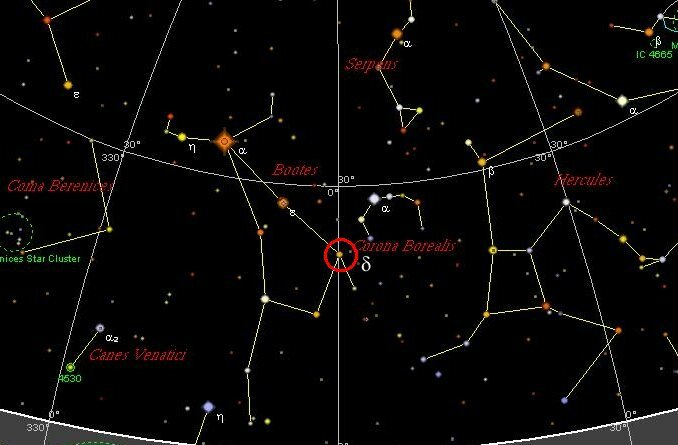 Saturn is on the border of the Beehive cluster, and looks very attractive in binoculars. This is the furst step in an array of planetary alignments that I will write about tomorrow. (Click to enlarge image). This beautiful image of Venus and the crescent Moon was sent to me by Bill Jones, and was taken on May 24th around 6 am from Surfside beach near Freeport, Texas. It's particularly lovely how the pair float above the waves. Thanks for sharing this great shot Bill. 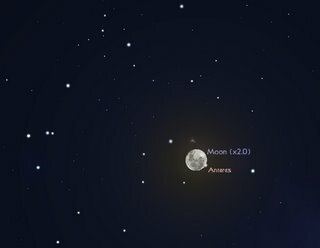 There are some great opportunities for seeing the Moon and planets line up in the next few weeks, so limber your cameras up folks. 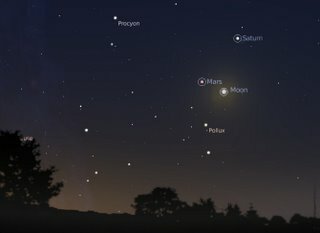 Tommorow night (Wednesday May 31) the crescent Moon is next to Mars and Saturn is just above them. On June 28, Mercury, Mars the crescent Moon and Saturn are all strung out in a line reasonably close together. And that's not all. I'll post about some amazing close encounters over the next few days. If you haven't read Stuart's post on the recent discovery of three Neptune size exoplanets, go over there now. 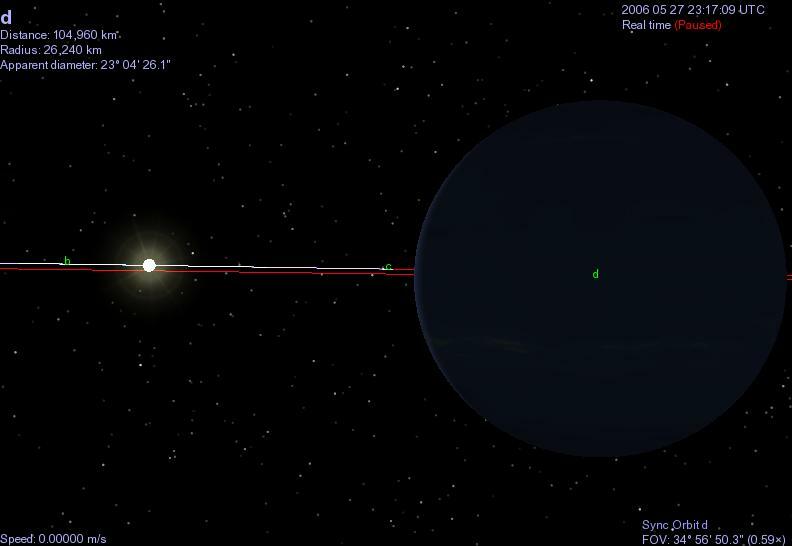 I've made a Celestia file for this solar system (minus the asteroid belt we know is around it). You can download the SSC file here. Note that Version 1.4 of Celestia uses different image file descriptions for several planets and asteroids compared to the early versions. All my previous files were set up for early version, so UB313 and the new Plutonian moons etc come out as blank spheres. 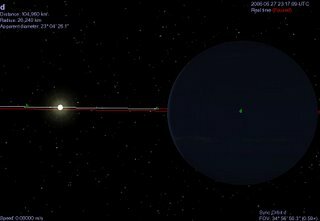 I've fixed Sylvia and the Plutonian Moons, I'll work my way through the others eventually (the old versions can be found here and here for people running Celestia 1.1-1.3). (Image Credit ESO [click to enlarge]) Anyway, back to the planets. This image is an "artistic rendering" from the ESO. Note that the images of the planets are greatly exaggerated in size compared to their actually sizes from the point of view (the Celestia image shows the correct observed sizes from a given vantage point). The size and density of the asteroid belt is also exaggerated. But hey, the point of these things is to capture peoples imaginations. The ESO site also has a nice press release on the planets, as well as some cool animations. (Image Credit ESO [click to enlarge]) People are really excited as at least one of these planets is in the putative habitable zone of liquid water. While they are not Earth-like in any real sense, they are the first good evidence that non-Jovian planets can end up in solar system type orbits. However, they may much up our understanding of how planets form. The hot superjovians completely messed up our first models, there was no way we could see that jovian planets could from so close to a sun. Now we have a migration model, where Large planets form far out from the star, and migrate in. These planets are thought to have migrated in after forming, but at least two have to migrate through the asteroid belt. While they won't have as big an effect as Jovians, I have a hard time understanding how migrating Neptunian worlds will leave a susbtantial asteroid belt (Stuart, Megan any ideas?). 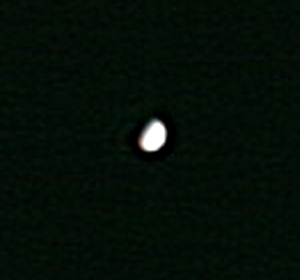 After nearly a month I finallly got an image of Venus. This has put a bit of a crimp in my Venus animation project. Clouds have been the bane of my life, on the very few occasons that the morning sky has been clear, I haven't had enough time to set up the scope before rushing off to work. This time the sky was crisp and clear, and the Milky Way easily observable even though near the horizon. As you can see, Venus is well past "half-moon" phase, and substantially smaller than my last image. Also had a look for 73P, guide stars down to mag 7.0 visible, couldn't see nary a comet though. 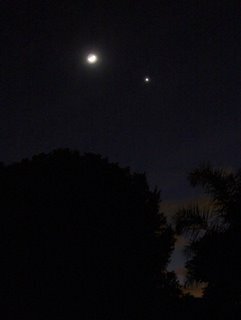 The Eastern horizon as seen from Adelaide at 5:00 am ACST (click to enlarge). Similar views will be seen form other Southern Hemisphere locations at a similar local time. 73P is fading now. As the Moon has left the morning sky, it is sufficently dark to make seeing 73P much easier, but it is closer to the threshold of unaided eye vision. I've updated my binocular spotters maps to make it easier to find. We in the Southern Hemisphere now have the best view of the comet. Here is a nice shot of jets from 73P-C, and a spectactular shot of 73P-B. Well, it's Friday, and here we all still are. No pieces of 73P hit us. But I completely forgot it was Towel Day. As did DaveP. After having a bit of a heavy couple of weeks with work related stuff and my oh, so late Sky&Space contribution. I've been "sleeping in" to catch up with the much needed raveller of the sleve of care. I was able to get out in the early twilight to catch some nice images of Venus near the Moon. On Wednesday, the Moon was sufficently close to Venus that I could use the Moon as a guide to find Venus in the day time. It was a snap picking out the bright spark of the planet near the Moons crescent. (click to enlarge image, once again, an image that is really bright on my monitor in Paintshop or Gimp is dark and muddy when acessed via Blogger Photos). 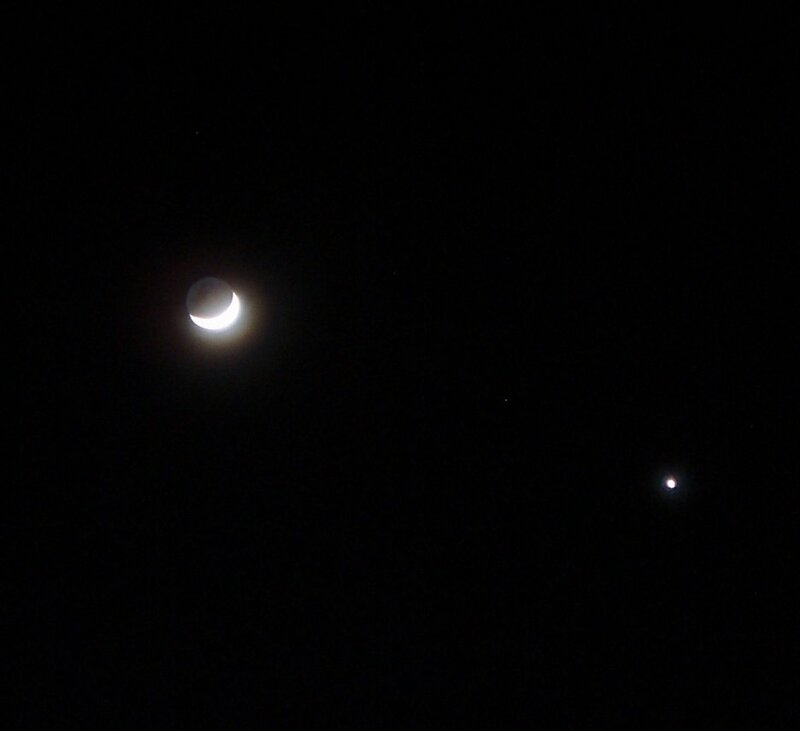 This one, taken on Thursday 25, with the Moon just two days from New, shows the Earthshine and maria very nicely. (click to enlarge) The image is sideways, to make it easier to view. The world will not end this Thursday. Fragments of 73P will not impact the Earth on Thursday. We are passing through the comets tail at the moment, but there is not enough material in it to give us a decent meteor shower (the Tau Herculids are the shower associated with 73P). I've written about this before here and here, and the Bad Astronomer has a few words to say as well. This morning the skies were clear! But could I see 73P? No way. This might have been something to do with the waning Moon being a mere 8 degrees away. But even in binoculars, where I could see down to magnitude 6.5 with no troubles, and 7.5 with averted vision, I still couldn't see them. This is most likely due to my eyesight, I have big problems with faint extended sources, so Maybe when the Moon is less of a problem I will have better luck. The Eastern Horizon as seen from Adelaide at 5:00 am 22 May. Similar views will be seen elsewhere in the Southern Hemisphere (click to enlarge). 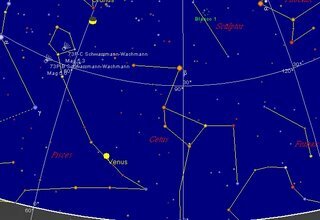 The comets will be near the waning Moon and above Venus. 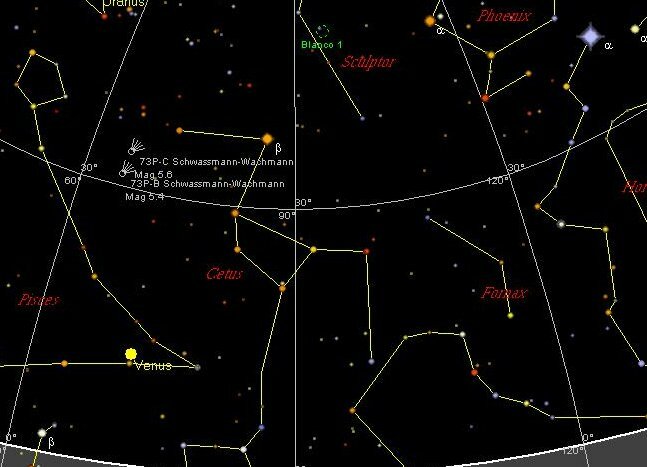 Well, comet 73P should start fading over the next week. I still haven't seen it. Cloud has been relentless here. We can have quite clear sunny days, then the cloud moves in as soon as I think of getting the scope out. 73P has been displaying more exciting behaviour. Here are some of the latest images of 73P-B, a nice summary of recent activity from Dr. P. Clay Sherrod, an S-band filter image showing knots and fragments and twin jets, a fanttastic animation from the same group, finally some recent images of both B and C.
... and that may mean aurora at high latitudes, like Southern Tasmania and New Zealand, over the next two days. Probabilities are low though. After 73P-B hogging all the limelight in the past few weeks, 73-C is now in outburst. Northeastern horizon as seen from Adelaide at 5.00 am, click to enlarge (similar views will be seen elsewhere in the southern hemisphere at equivalent local times). 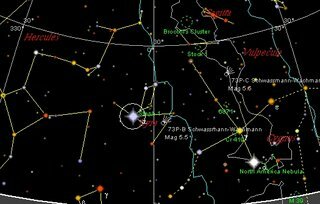 Also see maps at Southern Skywatch. I've been off air for a bit of a while as I write lectures and mark student papers, I'm also trying to finish my Sky&Space contribution, whihc is WAY overdue. But the next few days will be when the 73P frgments are at their brightest. I've been pretty well clouded out, but a couple of mornings ago the sky was clear ... and I saw nothing. Well, I thought I could see a faint furry smudge with averted vision in binoculars, but the Moonlight just washed everything else out. Othere people we reprting seeing 73P quite easily under Moonlight, so don't be discouraged by my lack of success. 73P-B is in outburst again, and it appears another large fragment has detached, see images here, here, here and here. A very nice animation is available to the patient here. Did you see the occultation of Antares? I didn't, clouded out again. But here is a nice video of Antares coming out from behind the dark limb of the Moon. Did a piece of space junk land in Queensland? Or is it a meteorite? News reports and meteor discussion groups have been buzzing with stories of what appears to be either a meteorite strike or a pice of space junk impacting around 6:30 pm last night. A bright fireball shot across the sky and there is an eyewitness account of an impact. You can read the ABC account here, nine msn has the account of the impact. Other reports are here and here. Mercury is the bright rayed object just near the Solar occultatin disk. The long rays are artefacts of the imaging system. A great movies of Mercury approaching the Sun is available in low resolution (256 Kb) and high resolution (1.6 Mb). Later this year Mercury will pass across the face of the Sun in a rare transit. 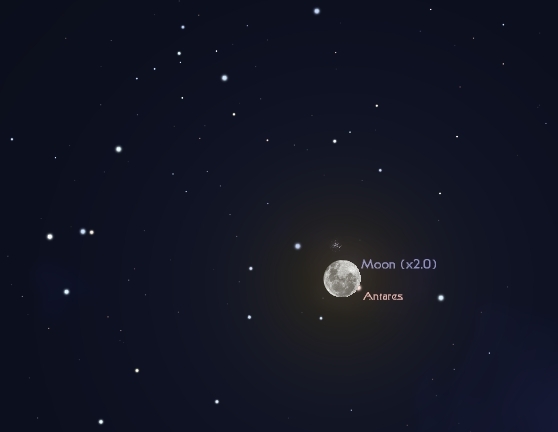 The Moon will occult Antares around midnight May 14 or early morning May 15, depending on your location. 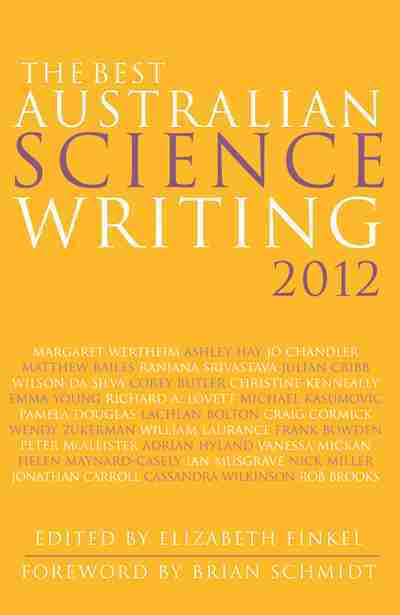 This will be visible in New Zealand, Australia and Indonesia. 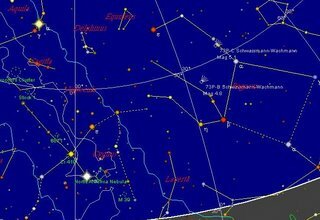 See the Southern Skywatch occulation page for times for your location. This amazing image is the infrared Spitzer Space Telescope's image of Comet 73P. The fragments of the comet stand out quite clearly in this infrared image, taken over 21 hours. 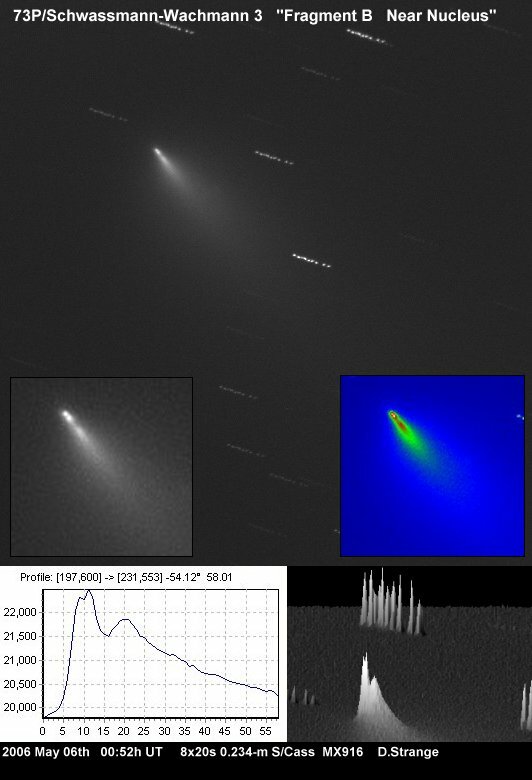 The the line bridging the fragments is the dust trail of the comet, invisible in normal light, but readily aparent in infrared. Read the media relase here, or download medium or high (4.3Mb) TIFF images. 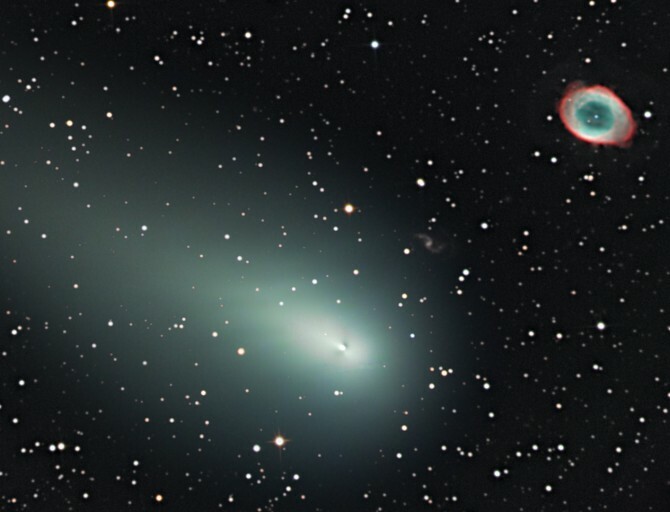 Astronomy Picture of the Day has yet another image of 73P-C and the Ring Nebula. A solar coronal hole sis about to move into geoeffective position. That means that there will be a 20% chance of minor geomagnetic storms on the 11th. 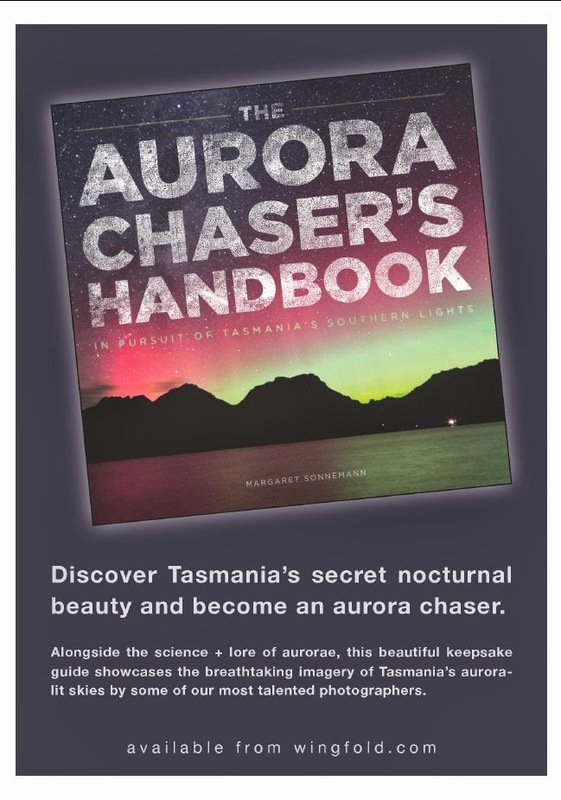 So comet watchers in Tasmania and New Zealand might possibly get an aurora to go with the comet. Northern horizon as seen from Adelaide at 4:00 am (click to enlarge), similar views will be seen in the Southern hemisphere at the equivalent local time. The circle is the field of view of 10x50 binoculars. 73P-B is in outburst again, it is currently magnitude 5 (which is bright for what it was usupposed to be), out shining 73P-C which is only magnitude 6 (73P-C should be two magnitudes brighter than B). Recent pictures are here and here. A magnificent animation of 73P-C passing by the ring nebula is here. (via the Badastronomer). But it is evolving so rapidly, and it's looking so pretty. See here and here for great fans of material around the head of 73P-B, replacing the streamers I posted about earlier. See also this series of images showing the rapid changes in 73P-B. 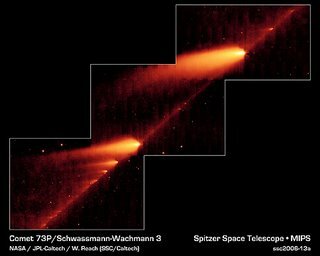 Comet fragment 73P-B is in outburst again, this time it has produced spectacular jets, see this amazing image from Carl Hergenrother, this one from the Campania group and this one from Ralf Vandenberg. 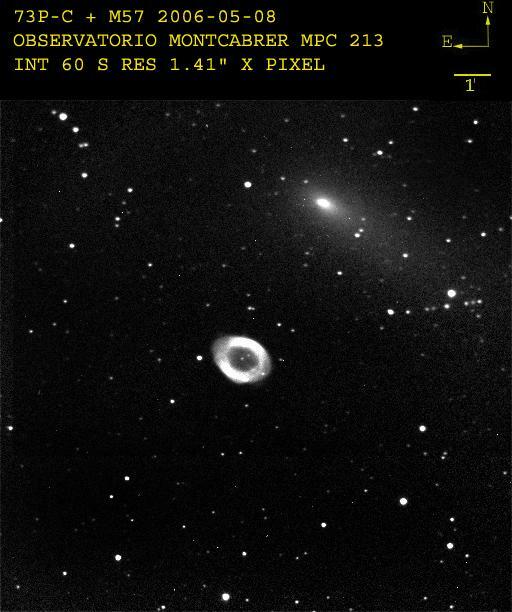 73P-C is not as dramatic, but it did pass close to M57, the Ring Nebula, recently, here is a very nice image from Raymon Naves and another very nice one from Gianluca Masi. 73P-C is reported at magnitude 6.0-6.2, 73P-B at magnitude 6.5-6.8. If you, like me, have recieved spam email from Eric Julien claiming that fragments of 73P will hit the Earth, ignore them, they are rubbish. The fact that they are based on a "psychic prediction" should be a dead giveaway. As I have noted before, the fragments of 73P won't come within millions of kilometers of us. The Bad Astronomer has more information on Eric Julien's nonsense. Update: A NASA article about 73P failing to hit Earth is here. The northern horizon as seen form Adelaide at 3.00 pm ACST. Similar views will be seen from other cities in the Southern hemisphere at the equivalent local time (click to enlarge). 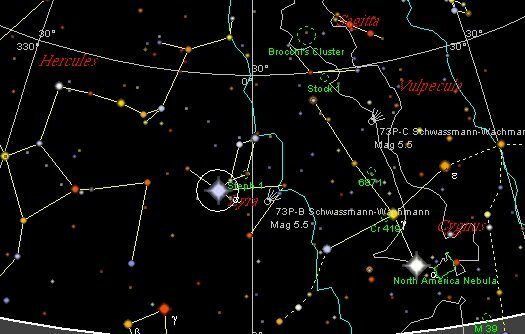 73P is now picking up pace as closest approach looms (and you have to get up earlier in the morning to see it), it's possible to see it move during an observing session. There are still plenty of amazing shots of the comet, especially the new break-up of 73P-B from Carl Hergenrother, Dave Strange, Clay Sherrod and Gianaluci Masi and co. Remember the thrilling pictures from the Hyugens Lander as it approached Titan's surface? Well, the clever people from the Hyugens mission have put together a stunning* Quicktime Video from the lander images. You can have a video with narration (15.4 Mb) which swoops down to the surface or a video where datasets are represented by chimes and clicks and the instrumentation results are displayed at the same time (11 Mb, it's rather charming). 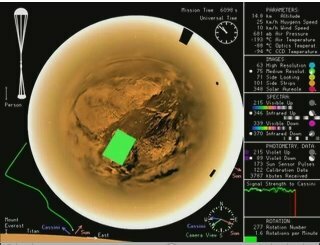 Other Titan related news is that the moon appears to be covered in giant sand dunes composed of particle of ice and organics. A tip of the hat to Nick Matzke of the Panda's Thumb for the heads up. *Yes, I know I use "stunning" a lot, but these videos are definitely worthy of that appellation. Jodcast is a podcast from the The University of Manchester's Jodrell Bank Observatory. It has a lot of interesting information (and I will put it in my links section Stuart, when I get a chance), as well as an interview with yours truly on it. So if you have a burning desire to hear what I sound like, pop over. Pop over anyway, it's a really informative show. Hughie is playing with me. For the first time in ages the sky wasn't clouded over, come sunset I set the telescope out side, hoping to catch the shadow transit of Io on the night of Jupiters opposition. But no, the clouds came over as soon as I had put Smallest One to bed. 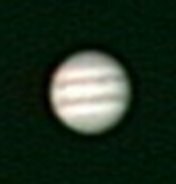 Fortunately there was a tiny window of clear sky and I got these two shots of Jupiter as Io cleared it (click to enlarge). The images are composites, I shot Jupiter at low exposure time, then cranked up the exposure to image the moons. 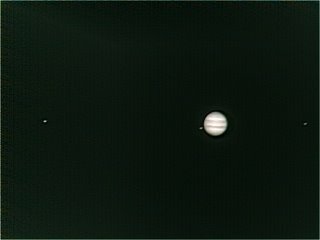 I then pasted Jupiter from the low exposure onto the over exposed Jupiter of the satellite image. (Each image is a stack of around 50 frames out of 60 in Registax). 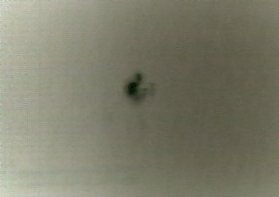 You can see quite a bit of detail in the enlarged images, which is pretty amazing given this is taken with an old webcam on a 4" unguided Newtonian. The top image shows some really nice cloud detail (when you click on it and get the enlarged view). I didn't get to see the new "son of the Great Red Spot", but new Hubble images have been released of it. 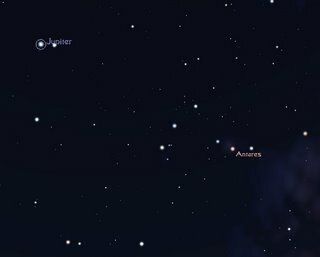 Jupiter is at opposition tonight, when it is at it's biggest and brightest. Oppositions of Jupiter don't get as much press as oppositions of Mars, probably because a) Mars holds such iconic staus in our imaginations, and b) even at it's furthest, Jupiter is still big and bright. 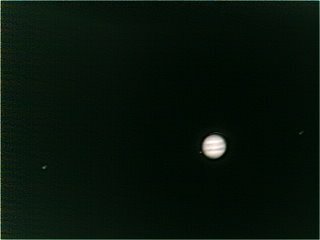 None the less, Jupiter and its Moons will be excellent objects tonight and for the rest of the month in binoculars or a small telescope (if you have a big telescope, then it goes wihout saying Jupiter will be good). SO do your level best to get to a telescope soon. Jupiter is failry easy to recognise, in the veneing, it is the brightest object in the eastern sky. Startlingly bright, although not as bright as Venus. Jupiter is just in from of the "T" shaped group of stars that mark the head of the constelation of Scorpius, the scorpio, making that area of the sky rather attractive. Tonight there is a dual transit and shadow transit of Io, starting at 17:20 and finishing at 21:20 tonight (ACST), but you will need a medreate sized telescope to see this. 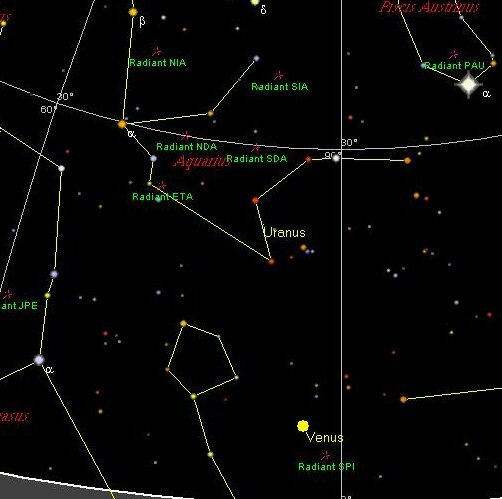 The Eta (n) Aquariids is a very reliable southern hemisphere shower. Unfortunately, it is a reliable morning shower. You have to get up around 3.30-4.00 am to see it at its best. 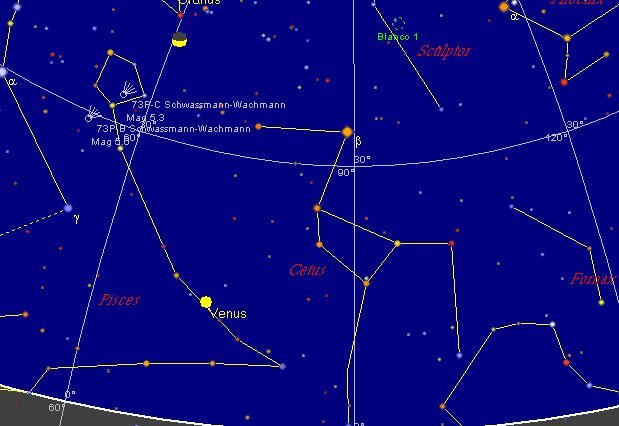 Well, you can also check out comet 73P to the north, and Venus as well at this hour. At 4.00 am the radiant of the shower (where the meteors appear to come from, marked by Radiant ETA on the map) is about 24 dgerees (four handsapns) above the easterm horizon. The Eta Aquariids is associated with Halleys comet, and consistes of fast, often bright meteors, some with persistant trails. Although the actual peak rate is around 2.00 pm Saturday in Australia, the best time to look is around 4.00 am Staurday morning. You can probably expect to see ameteor every 3 minutes. Today is 04-05-06. I was going to get up at three minutes past two so I could sy I witness 02:03:04:05:06, but sleep was a much better otion. 73P-B is in outburst again. 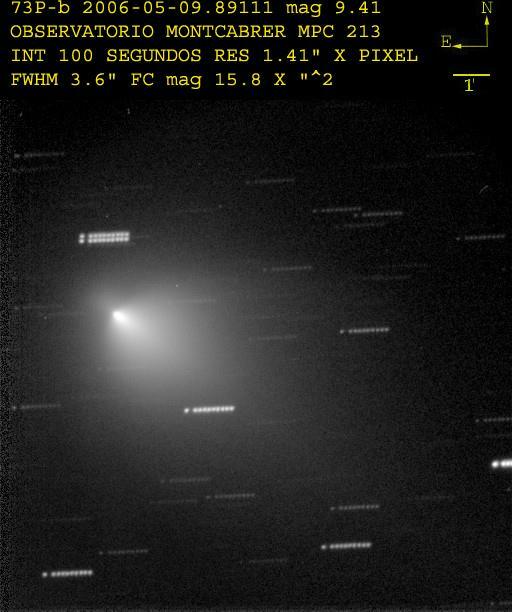 This latest image shows a long tail of material coming out of the comet, in addition the the fragmenst seen from the previous outburst. Here is another image showing a large fragment and here is a very nice animation. 73P-C is reported as visible to the unaided eye under dark skies (magnitude esitimates range from 6.0-6.3), and 73P-B has been reported as visible with averted vision under dark skies (mag range from 6.5 to 6.8). The May Southern Skywatch is out now. What's up this month? The opposition of Jupiter, unaided eye Callisto, unaided eye 73P, and an occultation of Antares amongst other things. Sunspot 875 is decaying, although it has fired off the occasional C class flare. Still it is big enough to sees with safe solar projection techniques (see how I set up here). You can even see it as a small dot on the sun with solar film "eclipse" galsses. The image here was taken with my web cam under less than ideal conditions (wind, an clouds passing over the Sun just as I would get a shot lined up), but while not high quality, it's not the blurry mess I expected, but there is some degree of structure. 875 still might fire off an M class flare big enough to trigger aurora, but I wouldn't hold my breath.